I love the personalitites and the balance that this podcast provides. It is creative and so much fun... and very helpful at times. My only negative would be that when it comes to answering e-mails, they are not researched in advance, so often the answer given is just a guess... and often the guess isn't accruate. Still one of my favorite podcasts. Keep up the great work! The Dreamflight video I downloaded is great except for one thing. IT WON'T GO ON MY IPOD!!! 5 star video, but it won't download onto my ipod. Please fix that. I have subscribed to multiple podcasts and this is not one of them. I have been viewing the shows for two years and havnt even had the desire to buy one. The topics are not the best and there are video podcasts out there that really and truely bring you back to the park. This is not a great choice. I was soo excited when I found this podcast!! I can watch all the parades and fireworks and remember good times and keep up with all the new things happening down at Disney. Thanks so much!! i think the best disney podcasts are the ones where you're actually on the rides and stuff. i dont really love this because in general, its really kinda wierd. If you are a Disney fan, or just a podcast fan in general, this is your podcast that you should subscribe to. Every week Ricky Birgante (the host of the show) puts in audio show that is usually over an hour long to give you that Disney fix you want and need, and he does it good. And to top that, now he has VIDEO? He has a splendid video release on top his audio podcast every week... keep up the great work Ricky. Okay your vids are alright but you keep saying that the sound quality is SO amazing when you advertise these. The sound keeps skipping until you cant hear anything anymore and it annoyed me to the point where im not coming back to get one of your vids unless you fix it. So, great scam you got goin here! When I download the Haunted Mansion reopening episode and put it in my ipod, I would only watch two minutes of the episode and it just skip the rest. Is this episode can't beable to play on any video ipod? Not sure what the latest podcast was about (Epcot tour), but the host sounded like a sourpuss, featured Disney's broken rides, complained about personal issues with the rides, and overall didn't come across as a Disney fan. I love how you plastered you ad for an upcoming show on the POTC video. Nice way to ruin something. If you want the most up to date Disney information, honest reviews, and a touch of Disney Magic, this is the best podcast for you. My whole family looks forward to this one every week! 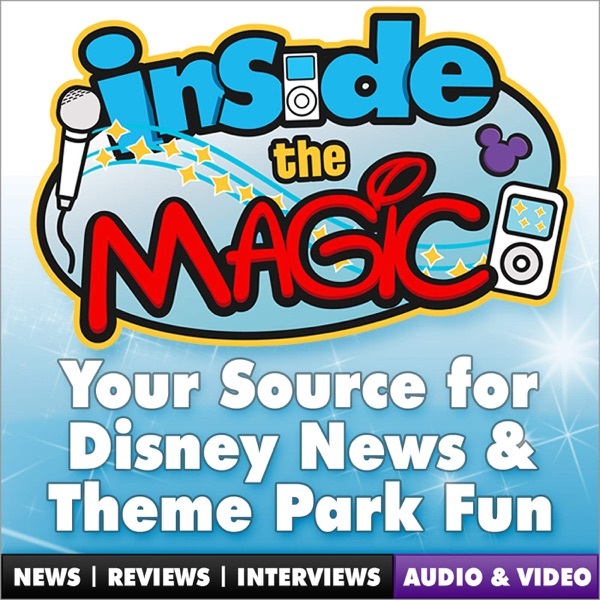 Inside the magic brings you not only news, but some great audio from the parks and backround music you sometimes miss.. really worth the listen. This is the best Podcast for Walt Disney World and is great for kids of all ages. Very family friendly Podcast. If you love Disney take the time to listen to this Podcast.